Cinnamon Lakeside Colombo is well known for its Thai, Chinese, Mediterranean, Japanese and International cuisine restaurants, but its North Indian cuisine is an unsung attraction. 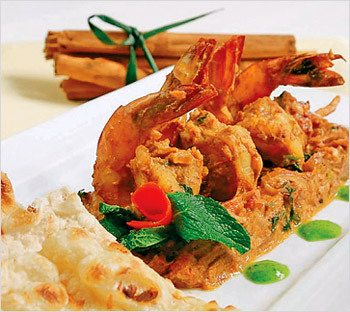 Chef Rana, originally of New Delhi, has been Lakeside's Indian wonder from as far back as its Saffron Restaurant days. His North Indian fare is well known amongst Colombo's culinary circles and surpasses that of other dedicated North Indian restaurants. Seven Degrees North features a signature North Indian dish every month but diners can order items from the North Indian menu while sitting in any restaurant at the hotel. Every month The Dining Room at Cinnamon Lakeside Colombo has something new to offer diners and this month is no exception. Due to the demand for good Indian and Sri Lankan food, The Dining Room chefs headed by Chef Rana from the Indian kitchen and Chef Wijesiri from the Sri Lankan kitchen, have cooked up with a spectacular menu consisting of both North Indian and Sri Lankan gastronomy. This impressive menu at the North India Meets Sri Lanka themed buffet highlights the best of both cuisines with traditional dishes hitting sharp and milder notes for the perfect balance. The buffet consists of many familiar items such as Tandoori kebabs such as Tandoori lamb chaap and Lasooni lobster, Dal palak shorba and Hydrabadi gost biriyani also known as mutton biriyani which is always a hit at the hotel. A flavoursome chicken preparation known as Murugh pistaju, Acchari macchi fish curry, Vegetable angan bari together with a variety of Naan's and Roti's are some of the must try dishes on this menu. Not letting the Sri Lankan side down, the buffet continues with crispy Plain hoppers, Egg hoppers, vegetable and chicken Kottu, and village mallums to name a few. This delightful fusion of cultures creates a culinary adventure that should not be missed out on. The special buffet is available until April 28 from 7pm to 11pm.